A cab-driving UKIP member has erected a 22ft by 9ft blue Christmas banner on his house which has angered a neighbour who says his message is “verging on racism”. Timothy ‘Dusty’ Miller’s annual Christmas messages have become something of a notorious tradition in his home town of Hedge End, near Southampton in southern England. This time, his seasonal statement has gone too far for some who believe it strays into racism reports The Daily Star. 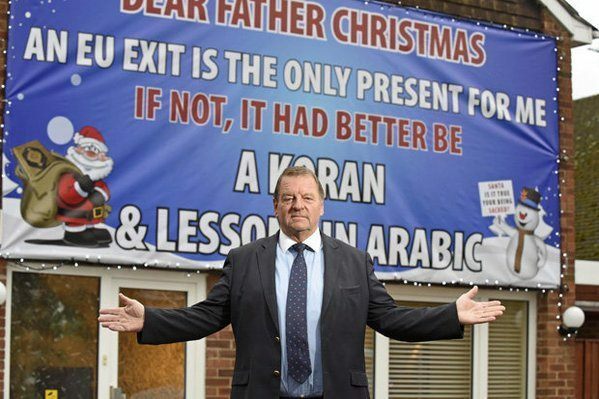 The massive Christmas banner (pictured above with Mr. Miller), written in bold white and red letters and featuring a cartoon Father Christmas carrying a Koran in his sack, reads: “Dear Father Christmas, an EU exit is the only present for me if not, it had better be a Koran & lessons in Arabic”. “I think it feeds into an argument of blaming the victims of things which include our own foreign policy, with a lot of people opposing intervention although the Government did it anyway. “It is worrying because when you take into account Donald Trump’s comments these days it is acceptable to blame Muslims for everything. “I do realise that the banner is on the edge, but I have taken it to the edge to get the desired result, and that is to get this talked about. “I’m not bashing Muslims at all, but there is a Government in Brussels that is giving away 70 million visas to a non-EU country. “Sadly those that say the banner is racist are not reading it within an academic mental state or from an academic point of view. 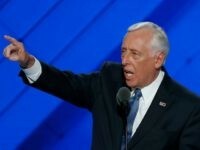 “That is the difficulty with political debate. Not everyone in Southampton finds the sign offensive. The local police say they have received no complaints about this year’s effort, although one of his previous attempts was brought to their attention police then confirmed no criminal offence had been committed. Hampshire County Council says there’s “no justification” for removing it from a planning point of view. The flag in the illustration was upside down, a traditional distress signal, but Mr. Miller insisted that had been intentional.